Sephora (Inside JCPenney) - FREE MAKEOVER! Stop by and recieve a FREE 15-Minute Makeover! - Yuma Palms Regional Center – Yuma, Arizona | Welcome To Yuma Palms!Yuma Palms Regional Center – Yuma, Arizona | Welcome To Yuma Palms! 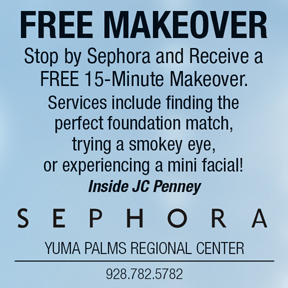 Sephora (Inside JCPenney) – FREE MAKEOVER! Stop by and recieve a FREE 15-Minute Makeover! Other restrictions may apply. See coupon for details.